How Does Yelp’s Review Filter Work? The best way to market your business is by managing your online reputation. It’s free. It’s easy. And all you have to do is provide high-value products and services. For anyone who’s invested time and money into their online marketing, understanding the way review algorithms filter the trustworthy from the untrustworthy is crucial. And with the ever-increasing popularity of Yelp, it’s become more important than ever to understand how their review filter works. With that in mind, we’re here to de-mystify the whole process and help you build your online reputation. Here’s what we currently know about Yelp’s review filter. What Is Yelp’s Review Filter? Yelp uses a set of criteria to weed out reviews that they deem untrustworthy. Yelp does not publish any details about their criteria, so what we do know is largely based on inference and third-party research. Nonetheless, we can be reasonably sure of the accuracy of this research. According to Yelp, their algorithm is based on three principles: “Quality, Reliability, and User Activity.” Yelp also reports that they filter out roughly 25% of all reviews, though recent evidence suggests the figure could be considerably higher. Why Does Yelp Filter Reviews? Like other review-aggregating platforms like Google, Yelp uses its filter to improve the quality of its review system. By hiding untrustworthy or fake reviews, Yelp helps businesses manage their online reputations in a more effective way. Ultimately, the goal is to make Yelp more trustworthy as a review platform. If it were filled with fake reviews no one would trust it. No one would use it. That would be the end of Yelp. Yelp doesn’t want that. Recommended Reviews: are reviews that contribute to the overall rating of a business. They are also the most accessible as they’re shown on each business’s Yelp profile page. Not Currently Recommended Reviews: are reviews that have been filtered out by the algorithm. They don’t contribute to the over all rating. However, it’s still possible to view the ‘Not Currently Recommended Reviews’ by scrolling to the bottom of the profile and clicking the link that reads “other reviews that are not currently recommended”. One of the interesting parts of Yelp’s algorithm is that it hides reviews until it deems them to be trustworthy. And vice-versa. That means there’s always the possibility of improvement over time. Has the reviewer’s profile been created recently? Has the user written any past reviews? What is the quality of the user’s past reviews? Does the review contain any misinformation? Or hateful or bigoted language? Is there evidence that the review was solicited? By taking account of these criteria (and, undoubtedly, much more) Yelp determines the overall relevance of each review. The best case scenario would be if all of your best customers were also active, trusted Yelp users. Unfortunately, this isn’t always the case. What Can I Do to Improve My Yelp Reviews? The best course of action is to provide amazing service and amazing products every time. That way, your clients will be inclined to leave amazing reviews without being asked. After all, Yelp does not encourage you to solicit reviews. And while you can try work around their policy to generate reviews, you may find yourself in deep water if Yelp decides to punish you for it. Another trick is to ask your clients to be more active on Yelp. Not by leaving reviews on your business, but by leaving reviews for other businesses. It may seem counter-intuitive but it will lend more clout to their reviews and make it less likely for Yelp to filter them out. That way, the reviews that best reflect your business will have a greater chance of landing on your page. 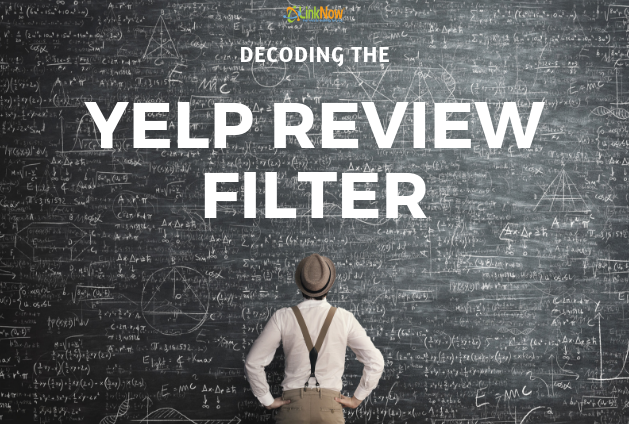 Do you have a story about your Yelp reviews or a fresh perspective on Yelp’s algorithm? Leave a comment below! And if you need a hand with managing your online reputation, get LinkNow’s local SEO team on the job!